Your search for 'Operation' has returned no results. 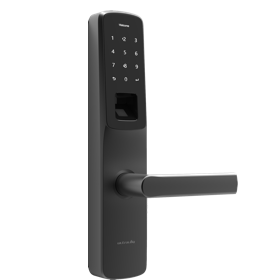 How to use Ultraloq UL1 smart lock in Standalone Mode? Does Ultraloq UL1 / Combo / UL3 BT smart lock support Smart Home Hub like Wink or SmartThings? We are working on the integration with all major smart home platforms. Wink and SmartThings are definitely in our product road map. You need to have Ultraloq Bridge. Does Ultraloq UL1 / Combo / UL3 BT smart lock support Alexa or IFTTT? Yes, you will need to have Ultraloq Bridge for Alexa and IFTTT. 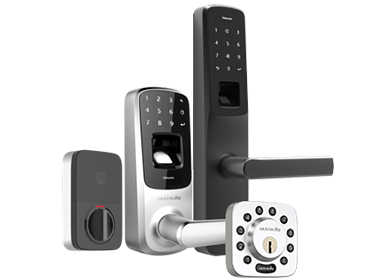 What are the max users we can program to Ultraloq UL1 / Combo smart lock? Total 100 users. Each user can register fingerprint, key fob, and smartphone to unlock. Can I still unlock Ultraloq UL1 smart lock if the batteries die? Yes, you can just use a coin to remove the battery cover and exchange batteries (2 X Alkaline AA batteries) from outside. Can I open Ultraloq UL1 / Combo smart lock if I don’t have my phone with me? Yes, you can use your fingerprint or key fob to unlock. Can I open Ultraloq UL3 BT smart lock if I don’t have internet access? Yes, you can use your fingerprint, code or your smartphone via Bluetooth to unlock. Can I open Ultraloq UL1 / Combo smart lock if I don’t have internet access? Yes, you can use your fingerprint, key fob or your smartphone via Bluetooth to unlock. 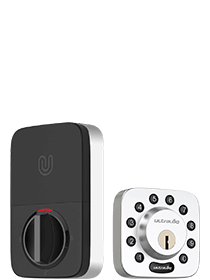 Does Ultraloq UL1 / UL3 auto relock smart lock? Yes, it auto relocks in 4 seconds. You can also set it to Free Passage or Lockout mode. How to reset UL1 as factory default? Use a paperclip to pin the Reset hole for 5 seconds. The Reset hole is on the side of the Internal Assembly. Note: Reset UL1 to factory reset mode. All data will be erased. How to program my fingerprint or code on Ultraloq UL3 BT / UL3 Smart Lock for the first time? Please note all information on the lock will be deleted. Here are some tips for how to place your fingerprint in a proper way during fingerprint registration and verification, which will help a lot in use. My fingerprint doesn't work on Ultraloq UL3 BT / UL3 Smart Lock. Here are some possible reasons and solutions. 1. If your fingerprint works sometimes, here are some tips. 1) It is highly recommended to follow the illustration below to register and verify your fingerprint properly. Make sure your finger is flatly placed in the center of the reader with some pressure for a better identification. 2) If your fingerprint is dry, please try to moisturize it by touching your forehead. 3) If your fingerprint is dirty, please try to clean it. 4) You might need to delete your fingerprint and register it again if you didn't follow the instruction above during registration. a. It is recommended that each user registers two or more fingerprints. b. Avoid the callus, peeling or injured finger to ensure the registration and identification successful. 2. If your fingerprint never works, it is most likely it hasn't been registered. Please register again. Why does my hard drive stop recording after it is full on CamGuardian H2-N8E / H2-D4 video recorder? Click "Advanced" and you can see "Disk". Check "Auto Overwrite" in "Disk-full operation".